“JSTONE. 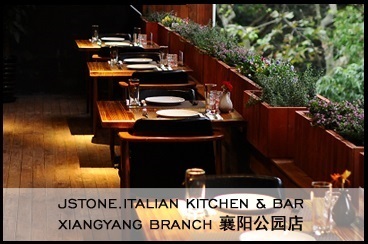 ITALIAN KITCHEN & BAR” The brand is committed to adhering to the tradition of Italian cuisine. We select fresh and good ingredients, adopted the Neapolitan traditional cooking method, only seasoning with sea salt and black pepper, and extract the essence of natural herb for delicate fragrance. Whether it is weekday lunch, wine dinner or weekend brunch. We have everything. Not only that, Jstone will design exquisite wine cellars in every restaurant for the collection of fine wines from Tuscany, Sicily and other regions, as well as unique Piedmont barolo, barbaresco and other DOCG-level wines. 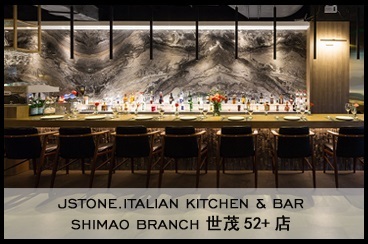 Jstone keen to traditional Italian food is incorporated in the dining environment of light and decorations, XIANGYANG PARK BRANCH has a clever mix of industrial and impressionist paintings, it`s an amazing success. 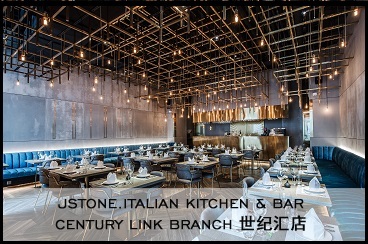 Now, we have a new concept for Century Link 5 floor, "BRASS" element, it is Jsone Italian Kitchen & bar “Century Link Branch”, it＇s dedicated to bring a refreshing Italian cuisine experience, walk inside, brass elements circle around, crisscrossed with the brass ceiling, coconut grey floor, simple solid wood table and crystal wine glasses, create a cozy dining atmosphere, the little candle light just add a refined for the people coming for dinner. Also a new concept for SHIMAO 52+ branch, “Chinese Blue and White Porcelain” element, it has blue and white porcelain wallpaper and blue and white porcelain vase, marble landscape painting. Enjoying Italian food in this environment is a special feeling. 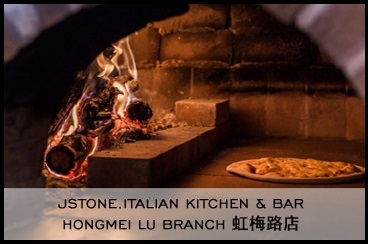 In Jstone Italian Kitchen & Bar, Roman hand-made pizza with a thin crust and crispy side is an Italian traditional food, that has been preserved from Italy to Shanghai for many years, the pizza sauce made from fresh tomato mixed with pure natural herbs, we selected imported mozzarella cheese, rich in protein, vitamins, minerals and calcium and low in calories, we used Italian pizza oven to bake our crispy pizza. 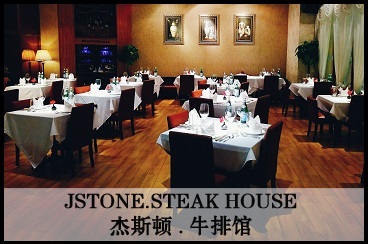 About steak, Jstone cooperated with Gippsland ranch in Australia, always adhere to selected healthy Angus cattle, to absorb balanced nutritients, the cattle is grain-fed during the last 200days of life, the absorption of nutrients transform into high-quality marbling, texture clear, succulent meat. The bone in rib eye 600 grams is the most famous of Australian steaks, based on a rib, and after being aged 21 days, cooked it to medium rare is at it‘ｓbest, guests feel plentiful juice on the lips, the surface layer of beef is brown seared, layer upon layer release attractive fragrance, After being cut, can find beautiful pink and tender color. The color, aroma and taste are all bursting out. It is the most irresistible temptation. The ribs of a mature cattle can be cut into 7 pieces only, so it needs to be booked in advance everyday. Meanwhile, Australian Wagyu beef sirloin is another good and high level steak, just simply grilled, marble fat oil began to melt and distribute evenly in the meat, smelling a sweet butter flavor, texture smooth, white marble oil structure, no nerves, the meat melt in your mouth, like snowflakes fall into the mouth, the juice is like a thick stock, it is worth noting that even without sauce, it is also delicious.